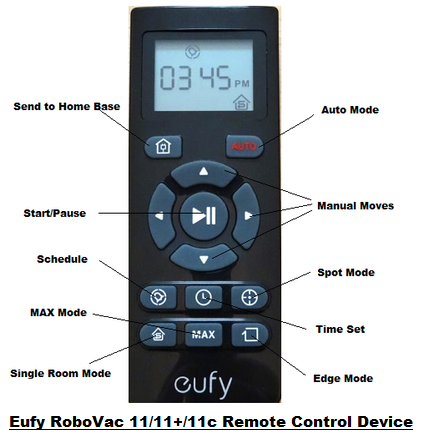 We have recently received many requests for an article comparing the Eufy RoboVac vacuuming robots. This is not surprising when one considers that these very affordable robots have been extremely popular and have received mostly excellent reviews. This article will compare three of the older Eufy vacuuming robots, the Eufy RoboVac 11, RoboVac 11+ and RoboVac 11c. It will describe in detail the features of these three robots, so you may choose the right one for your home's cleaning needs. ​Note: More recently Eufy has released four newer vacuuming robots that are improved versions of the three robots listed above. They are RoboVac 11S, RoboVac 15C, RoboVac 30 and RoboVac 30C. 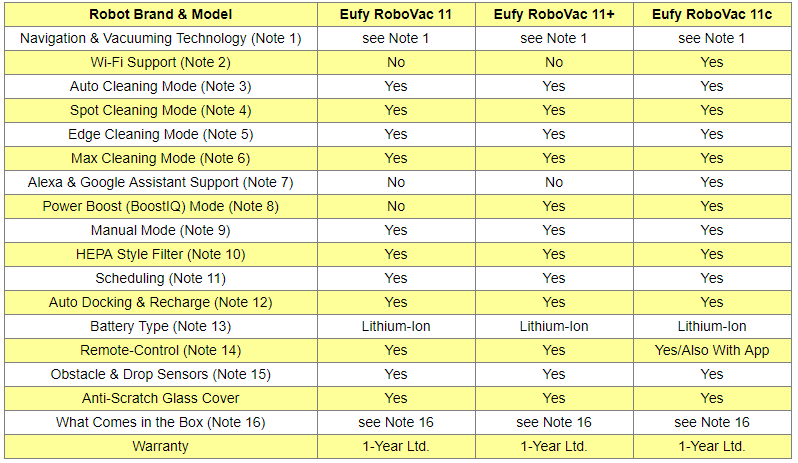 If you'd rather see a detailed comparison of these newer Eufy vacuuming robots, please click: Latest (2019) Eufy RoboVac Vacuuming Robots Comparison. This article will compare the Eufy RoboVac 11, Eufy RoboVac 11+ and Eufy RoboVac 11c vacuuming robots. Selected Eufy RoboVac Vacuuming Robots on Amazon. All three RoboVac robots considered here calculate the room size and optimize the path to be followed by selecting automatically different cleaning modes until cleaning is complete. Their versatile cleaning modes and their low-profile design allow cleaning under most furniture, and they can be used on various types of floors - low pile carpet, tile, hardwood, laminate and more. Note that these robots also use a HEPA style filter that handles very well hair, pet fur, lint, carpet fuzz and other various allergens. A rolling main brush that picks up dust, debris, dirt, pet hair from the floor. ​Note that the brush that comes with Robovac 11+ and 11c was redesigned: it is wider and reduces trapping rugs and sheets. Double 3-prong spinning side brushes that clean along wall edges. Wi-Fi support simply means that you will be able to control your robot from wherever you may be using your smartphone! In Auto mode the robot will calculate the room size and optimize the path to be followed by selecting automatically different cleaning modes until cleaning is complete. When Spot Cleaning mode is invoked, the robot will intensively clean a specific area in a spiral manner. When Edge Cleaning is invoked, the robot reduces its speed when it detects a wall and follows the wall to make sure that the edge is cleaned thoroughly. When you choose Max mode, the robot starts cleaning with maximum suction power. This is great when vacuuming carpets. Alexa and Google Assistant compatibility means that you can control your robot hands free with voice commands! ​The Power Boost (BoostIQ) feature, built into RoboVac 11+ and 11c, automatically increases the suction power when extra vacuuming strength is needed to get the best cleaning results. Note that the maximum suction power of RoboVac 11+ is 1000pa and the maximum suction power of RoboVac 11c is 1200pa. All three RoboVac robots can manually be directed where to clean by using the arrows on their Remote Control device. When batteries run low, all three robots considered here return to their Charging Base to dock and recharge. Lithium-Ion batteries are designed to provide longer cleaning sessions and last longer before needing to be replaced. All three RoboVac robots come with a Remote Control device. The device allows various operations such as the cleaning mode selection (Auto/Spot/Edge/MAX), manual orientation of the robot using the arrows, pausing the robot and activating, sending the robot to charging base, setting the time and scheduling. All three robots are equipped with obstacle sensing sensors and drop sensing technology. 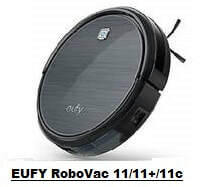 ​Eufy RoboVac 11, Remote Control (requires 2 AAA batteries, not included), Charging Base, AC Power Adapter, Cleaning Tool, High-Performance Flter, 4 Side Brushes, Welcome Guide and 12-Month Warranty. ​Eufy RoboVac 11+, Remote Control (2 AAA batteries included), Charging Base, AC Power Adapter, Cleaning Tool, Extra Set of High-Performance Flter, Extra Set of Side Brushes, Welcome Guide and 12-Month Warranty. So which of these three robots should you buy? RoboVac 11c is the only one of the three robots that support Wi-Fi and is compatible with both Alexa and Google Assistant. So it is the only one of the three that can be controlled using your smartphone or hands-free with voice commands. RoboVac 11+ and 11c are the only two that have the additional Power Boost (BoostIQ) feature which automatically increases suction power when extra vacuuming strength is needed to get the best cleaning results. If you have pets and want a robot that can deal well with pet hair, you should consider RoboVac 11c which can boost the suction power up to 1200pa. ​The main brush that comes with Robovac 11+ and 11c was redesigned: it is wider and reduces trapping rugs and sheets. Given the above information, and the fact that currently RoboVac 11+ is available at a lower cost than RoboVac 11 on Amazon, it clearly makes sense to choose RoboVac 11+, if you don't need to control your robot using your smartphone. Otherwise, you should consider getting RoboVac 11c. Please click the vacuuming robot of your choice below for price information or to purchase. Amazon often provides a good discount on the List Price of sold products. If a discount is available, the List Price and the actual Amazon price will be shown when you click the Amazon product link images below.